Fear the Walking Dead, not pictured: the walking dead. 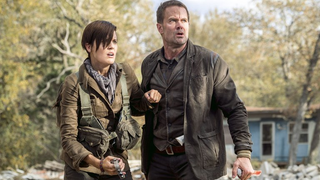 Fear the Walking Dead, the prequel spin-off of The Walking Dead, still has a lot of fear left in it, as this weekend at the Television Critic’s Association it was confirmed the AMC series is getting a fifth season. The television juggernaut of The Walking Dead is now as a whole confirmed for fourteen seasons of television, nine for the original The Walking Dead and five for Fear, proving that the zombie franchise is still a huge deal to AMC even as its cultural star has dipped a bit in past years. A trailer for the second half of the fourth season was shown recently at Comic-Con, showing zombie tornados and promising an increase in surreal horror. That second half will start on August 12, and the fifth season will air probably in 2019.